Using TV to Promote Positive Customer Experiences - Increase visitor satisfaction, social media followership, and the effectiveness of your business' marketing campaigns. Hospital TV systems are a growing trend in the medical industry. As the technology grows, more and more hospitals are turning to waiting room TV software and medical office signage to educate patients and engage with them more. Patient education and engagement is important to every hospital. Whether it’s posters, literature, or a medical display; a lot of time and effort is put into connecting with visitors and delivering health information to people in waiting. But how effective are these techniques in the long run? The trick is finding the best medical TV software. TV packages for waiting rooms vary. If your goal is to educate patients, you’re going to need medical content; but it’s not that simple. A common mistake that hospitals make is having too much medical content. Keep reading and you’ll see why waiting room television should be balanced. Wanting to educate your patients is a good thing, however it’s important not to over-expose them. Moderation is key. A waiting room TV that only shows medical content might be boring, or unsettling. However educational it might be; who wants to watch countless 3D models of a clogged arteries? Or see a graphic video of an eyeball getting scraped? No one – that’s who. Looping medical displays are bad for that reason; having that type of content is a great way to get patients to ignore what’s on the TV and look at their phones instead. People are likely to look at the TV when there’s something fun or interesting on it. Providing a balance of educational medical content – mixed with fun and engaging videos is the way to go. Finding the right waiting room TV software which offers the best of both worlds is the next step. TV for waiting rooms doesn’t have to be a complicated thing. It’s Relevant TV makes sure it’s not. It’s Relevant (Also known across the country as Rele.TV) is a custom TV network which provides hospitals and medical clinics with quality, family-friendly content. It’s waiting room television that you control. You pick what categories patients will see while they wait; which will play alongside any waiting room videos, medical-related content, or personal messaging you upload to the network. IRTV is a tool which blends the educational videos you want patients to see, as well as the fun and engaging content they enjoy watching. When it comes to hospital TV and waiting room digital signage, It’s Relevant TV is all you need to create a signature waiting area environment for your visitors. Auto Shows are a grand affair. Top brands from all corners of the US gather together to show off new models, talk about new technology, and explore new trends in the industry with experts, innovators, and car enthusiasts alike. With so much coverage and exposure, it’s no surprise that brands have taken auto show marketing seriously. But should they? This article will go on to explore the declining trend in auto shows, take a closer look at why so many major carmakers are bailing-out, and even suggest a better way to invest those marketing dollars. At the time of this article’s release, the New York International Auto Show is just beginning. It is just one of many big annual car shows that, like the NAIAS or The Chicago Auto Show; attract hundreds of thousands of visitors, and feature hundreds of new models each year. Usually, those numbers are nothing to scoff at – however for the first time ever some major car brands are thinking twice about attending. It’s not because of cost, but rather practicality. The people who purchase spaces at these events spare no expense. It’s go big, or go home- So of course it’s going to cost millions for the space, the stage, and all of the lights, carpeting, and furniture – all of which are branded, brand-consistent, and designed to stand out and steal the splotlight. The problem? So is everyone else’s space. Some of the major carmakers who are backing out of these grand auto shows are citing the presence of competition on the show floor as being the reason for calling it quits. It just isn’t worth it – not when they could be getting better mileage out of those millions outside of the show. As a result? The major brands are looking for new ways to invest their money, and achieve true ROI. The same energy, flare, and attention that goes into sprucing up your space at one of these big auto shows could go a long way at your brand’s dealership locations. Making sure the people you have attracted to the door enjoy their visits, and ultimately decide to purchase from you is of the utmost importance. And it’s something you can likely achieve for much less. By investing that time and money into improving your waiting areas, show floor, and amenities, you’re improving the things that really make a lasting impression on the people who are visiting your dealerships – which are really the people you want to impress, and please, to get them to purchase. Customers are the ones driving your product around, they’re the ones who will buy from you again, and they’re the ones who will talk positively about your brand, for free, and recommend you to friends and family. The right approach, and the right message, go a long way. If you’re investing some of your marketing budget on branding and enhancing visitor experience, the TV is a great place to start. How you get your message across to visitors is just as important as the message itself. TVs are effective at getting people’s attention. If you put something on a TV people are watching, 9 times out of 10 someone is going to see it. It’s Relevant TV is a television service that more and more dealerships are switching to. It doesn’t come with the high monthly cost, lack of control, or risk of competitor ads that cable does. It replaces all of those things with a custom channel that’s easy to manage, is fully customizable, and allows you to showcase your own personal videos, messaging, social media and brand. It’s a great way to get all the things you want noticed, and all the content that comes with it is designed to keep people entertained, and informed. All while keeping brand consistency across the board. Social media TV software is becoming a prominent feature in successful businesses. But why is this? How can featuring something as simple as Facebook, Twitter, or Instagram on your business’ TV help improve the business itself? This article helps answer these questions, and explores the benefit of using digital TV software to get your social media posts on the TV. Whether you’re tech savvy, or like to keep things simple, digital signage can work for you. However, not all digital signage services allow you to integrate your social media accounts with your screen, while still keeping TV programming. If you’re not sure how to get what’s on your phone, onto your business TV – or if you weren’t aware social media TV software was a thing; take a look at It’s Relevant TV. It’s Relevant is the go-to for restaurant TV, urgent care TV, waiting room TV, and business TV in general. Businesses across the U.S., in a variety of industries, rely on It’s Relevant TV as a promotion platform. Why is your business on social media in the first place? More often than not, it’s to keep your brand top of mind. There are many ways to use social media to get your business noticed more. Some business owners use it to feature new, or enticing offers, specials, or reasons to stop by; whereas others use it as a platform to advertise local events, organizations that they support, or use it to showcase interests/hobbies they might share with followers in order to relate to them more. But getting them to follow you is the trick, isn’t it? But just as important as gaining followers, is who you get to follow you. The best social media followers are the ones that have been to your location. They are the most receptive and mindful of your brand. Your posts are only effective when the right people see them. Business TV software that integrates your social media gets people who aren’t following you to do so- because they see what they’re missing. Whether it’s specials, promotions, memes, or straight-up interesting posts related to your brand; when you show people what they get by following you, there’s a higher chance that they”ll become a follower. It’s easier than people realize to get visitors to follow you on social media. Two of the main reasons people use social media are to be entertained and informed. So long as you make an effort to show people that there’s value to your posts, you’re bound to generate an increasing number of followers for it. It’s not just about talking about your business. Some of the most successful social media brands mix in trivia, fun facts, or unrelated information for follower enjoyment. The right social media TV software isn’t just for getting your business noticed more, or getting more followers; it can also result in the generation of new or repeat business. Displaying positive or interesting posts from Facebook, Twitter, or Instagram on the TV is a great way to craft a welcoming environment that people will find comfortable, and wouldn’t mind revisiting again and again – often with friends or family. A social media display for your business is definitely an effortless step in the right direction towards maintaining a place people enjoying visiting. It’s Relevant TV is an innovative TV platform which delivers entertaining, and engaging short-form content that is better suited for businesses over cable or satellite TV – it’s also the #1 top choice for business owners who are looking for a way to display their social media on their TV. Whether you’re on Facebook, Twitter, or Instagram; It’s Relevant gives you the freedom to integrate posts from your social media accounts and display them automatically in between licensed TV content; getting people to notice it while they’re in a receptive mood. It’s Relevant is safe. Visitors will only see the posts you want them to see without negative comments or ratings getting in the way – so there’s no risk. Just a higher chance to generate more followers, and more business. Check out It’s Relevant, and explore what social media TV software can do for your business. With things like Google, Yelp, and social media being as prevalent as they are today, customer reviews have become a cornerstone for any successful business. Whether you own a restaurant, a car dealership, or a medical office; something as simple as a sentence has the power to bring potential visitors to your door, or scare them away. So, how does one generate good reviews? What can business owners do to prevent visitors from writing bad reviews? This article will briefly touch upon the top 3 things any business owner can do to improve customer reviews. First and foremost, your business needs to look presentable. It has to be a place people wont mind waiting inside of, or dining at, for any length of time. The following article: Top 5 Factors to Enhance Your Business Environment, is a good place to start looking for ways to spruce up your location. When your business is tidy, in shape – with nothing falling apart, and with tables/furniture arranged nicely, it becomes a far more welcoming place. Staff friendliness also goes a long way. If you’ve ever read bad reviews of other businesses, they’re usually about someone’s bad experience regarding cleanliness, or the staff’s supposed “bad attitude.” Going the extra mile, and doing what you can to minimize those experiences; i.e. becoming more engaged with your staff, replacing old furniture, or adding some new decor, is all anyone can do in the short-term. Try and take a look at your business through the eyes of your visitors and see what might be improved. The smallest changes make a big difference. If there’s one truth regarding customer reviews, it’s that people are more likely to leave a bad review, than a good review. When someone has a particularly bad experience, they want the world to know. They want to take out their anger and frustration the easiest way they can; on the internet. Whether or not a bad review is true, or accurate, is irrelevant. It’s there for the world to see, and if you’re not mindful of what people are saying about your business, what you don’t know will hurt you. Thankfully, finding out what people are saying is as easy as Googling your business and reading the reviews. Few business owners actually read online reviews about their business, and even fewer respond to those reviews. It’s important to look into what people are saying; and if you find a review that you’re able to comment on, set the record straight. Address the issue, take responsibility for what might have happened, and rectify the problem to the best of your ability. Taking some time to research customer reviews in a timely manner, or assigning someone to address them, is the best thing you can do to salvage your reputation after someone has had a bad experience. Commenting on good reviews; letting customers know you appreciate their feedback, never hurts as well. Crack down on bad customer experience with It’s Relevant TV; a TV solution which combines television and digital messaging – giving businesses owners real control over what shows up on their TV. When businesses have more control, it’s easier to create a more positive environment; reducing the chance of a bad experience, and bad reviews. It’s Relevant is a platform that allows you to engage more with your customers. With the ability to upload your own custom messaging; show your visitors that a good experience is a top priority with TV-messaging that gives them a way to contact you directly about problems, or concerns they might have. When you provide customers with a direct way to communicate with you, they’re less likely to go home and leave a negative review on the internet for the world to see. Bad experiences are inevitable – it happens. But even if a customer does have a negative experience, make sure you hear about it first. If you’re interested in exploring ways to better engage with your visitors and improve online reviews, then It’s Relevant TV is a great place to start. Out-of-home advertising is an ace in the deck of advertisement. However, with so many hands to deal out to, settling on the right platform to advertise on can be tricky. This article will identify some of the most popular and effective ways of getting your message out there. However, if you’re only interested in the top, most effective and flexible advertising platform in the growing industry, then check out It’s Relevant TV. Knowing the most popular, or most effective ways of advertising is only half the battle. To make the most out of your marketing dollars and reduce wasteful spending, it pays to identify the strengths and weaknesses of each option. There isn’t a single platform listed below that isn’t effective in its own way; although effective or not, certain ones may not be a fit for your budget, your brand, or your target consumer. The more you know, the better. Because who doesn’t notice a 50ft wide sign on the side of the highway? For many years, billboards have been a popular out-of-home advertising solution; and for good reason. Hundreds or thousand of people, if not more, pass any given billboard each day. It is an effective means of getting your brand noticed, if not an expensive one. Costing as much as $3,000 – $30,000 a month, there may be wiser, more cost-effective ways to advertise your product or services. Advertisements on the sides of buildings, bus stops, street kiosks, newsstands, and benches are a common sight. It’s simple, somewhat cost-effective, and it’s definitely in view of the public. With so many people seeing it day after day, what could go wrong? Constant exposure is great, but how many people out of the thousands+ that see it, take advantage of it? The answer; not as many as there could be. As with advertising on billboards, or even transportation, wasteful spending is rampant. While more people = higher chances of you hitting your target consumer, too many of your marketing dollars are spent advertising to people who aren’t interested. So long as there’s a blank commercial space to fill, advertisers will often pay top dollar to stamp it with their brand; busses, taxis, trains, cars, and even planes are no exception. Advertising on transit vehicles is just as effective as street advertising, except the adspace is moving all over the place, exposing the messaging to a more widespread geographic consumer base. As effective as it can be, it still suffers the same degree of wasteful spending that most out-of-home advertising platforms face; reaching many people beyond your target demographics. Malls, movie theaters, sports arenas, shopping outlets, and the like; these are all prime spots to showcase what you’re selling. If you are in retail, what better place to put your ad than 100 yards away from where you can get it? Especially if people are going to be passing it all day. Sticking your advertising close to your store, or business, definitely comes with the advantage of convenience. The only thing that’s closer is advertising inside a business itself. Waiting rooms, lobbies, restaurants, retailers, car dealerships, or medical offices; It’s Relevant TV allows you to directly advertise to your target consumers at times they are prone to looking at a TV and receptive to what’s being played. If you’re looking for a cost-effective advertising solution with the best medium to fit your budget, then It’s Relevant is your best bet. Unlike most platforms like billboards or street advertising, which cost hundreds, if not thousands, of dollars; It’s Relevant showcases your ad on the TV for just 30–50 cents a play; letting you run a standard television commercial in diverse targeted locations across the country. It’s Relevant features scaleability and specificity. You can limit your ad buys to geographic zones and business categories that you specify. Looking to reach people in restaurants within 10 miles of certain city? It’s Relevant TV lets you do that. Purchase ads in just those locations, and get exactly what you want while eliminating wasteful spending. Look into Advertising on It’s Relevant TV, and put your messaging where it matters most. Digital signage software providers and marketing companies like to squeeze as many features as possible into packages for clients; but how much is too much? You might stumble upon a company which provides waiting room TV software that satisfies what you’re looking for, but you also find out the same company provides additional, unrelated services. Is this really a bad thing? It can be. This article will show you some things to look out for when shopping for digital signage software. 1.) Unrelated Services: Say you more or less find what you’re looking for in a digital signage service; except, as you learn more about this company, you discover that they provide a lot more than just TV software for businesses. Services like personalized phone messages, WiFi-marketing, and scented waiting spaces. The additional services pile up and are marketed as “differentiators” or “one-stop shops”. But what’s bad about getting more? There’s a convenience attached to going with a provider that caters to multiple needs; however you lose out on quality. A television software provider that has spread its eggs into 10 baskets is not putting 100% into any single one of them. And they certainly aren’t providing your business with the best digital TV software on the market. Unrelated services not relevant to the TV take away time and focus towards creating the best TV experience for your business, and viewers- which we would argue is more important than some of the other considerations. 2.) Focused Content: TV software that is well put-together, but only features industry-specific content, is a red flag. While our research shows that this is the largest concern for medical offices, it can be a problem for any industry. But why is it a problem? In the case of medical offices, a digital TV display that shows exclusively medical-related content tends to bore or frustrate patients. Patients visit a doctor’s office for medical-related issues – that doesn’t mean they want to watch medical-related TV while they wait. While it might seem like straight up medical TV is a “good fit” for medical waiting rooms – it tends to reduce patient satisfaction, which can have an obvious negative effect on future visits. TV is potentially the longest; definitely the most impressionable, part of a visitor’s experience. For this reason; It’s Relevant TV focuses exclusively on delivering quality custom TV content. IRTV does not dabble in other marketing industries, instead they have build a feature-rich platform and network with the ability to mix in your own videos, social media posts, and marketing messages to visitors while they wait. Because It’s Relevant doesn’t distract itself by trying to provide more than the best TV experience possible, businesses can count on it to deliver just that; a TV experience which exposes visitors to your messaging in a positive way, encourages return visits, and strengthens your brand. If you’re shopping for forward-thinking TV software, check out It’s Relevant TV. It’s Relevant TV costs less than its competitors, while providing a lot more in its service offering. Recently featured in an article by Automotive News about custom dealership TV systems, It’s Relevant TV comes out on top when it comes to features and affordability. Comparing IRTV to “other leaders in the field;” the article presents a short-list of digital dealership TV providers – which illustrates that even though It’s Relevant TV costs less than its competitors, while providing a lot more in its service offering. This is something that Jimmy Macagna of Mercedes-Benz, who is featured in the article, knows and has experienced first-hand. There are a few names in the industry that come to mind. However, the article from Automotive News singled out the most successful, and most innovative, car dealership TV vendors out there. Whether you’re currently using a custom TV service and you’re exploring options, or looking to cut cable and get your feet wet; the following comparison guide will help you settle on a custom dealership TV solution that fits your brand, budget, and marketing goals. Available for as low as $99/month, It’s Relevant TV’s all-inclusive subscription is a cost-effective solution for dealership owners looking for a better alternative to cable, or digital signage services that are boring or don’t fit their budget. It’s Relevant TV is truly a premiere custom dealership TV service. Content: It’s Relevant TV features the largest living library of licensed content in the US; with over 500,000 short-form videos spread across 40+ categories for clients to pick and choose from. Content includes up-to-the-minute video news, home/garden, celebrity interviews, food/cooking, car shows, fashion, pets, travel and more. All videos are family friendly, and pre-screened to ensure that safe, quality content is delivered to your TV. Additionally, content isn’t limited to what It’s Relevant TV delivers. Personal videos and side ads showcasing your brand may be uploaded and featured alongside IRTV’s licensed content; informing visitors on sales, services, and important messaging you want them to see; all as they watch fun and interesting content. Cost: Briefly hinted at above; It’s Relevant TV’s pricing is set as the lowest in the pack. Two full-featured plans are available: $99/month for users who sign up for a year, and $126/month for users who prefer not to “be stuck” in a contract. IRTV is all-inclusive; meaning that it doesn’t matter if you’re under a yearly contract, or paying month-to-month, you have access to all of It’s Relevant’s features and a dedicated client success manager who not only helps you manage your account, but also contributes graphic design services free of charge. Customization: The content, videos, promotions, and live social media feeds on It’s Relevant TV are fully customizable. Users are able tailor video content categories to their customers, upload their own dealership videos, control how frequently their personal messaging appears, post relevant headlines, showcase full screen and partial screen promotions, integrate Facebook, Instagram and Twitter, tailor messaging to specific days, and hours of the week; even add subtitles to videos. All of which can be controlled from any tablet, computer or smartphone; from anywhere. Customizations take effect on all screens within the hour, and don’t require weeks of waiting to be implemented. Competitive Ad Block®: No one wants to see their competitors’ ads show up on their TV screens. It’s Relevant TV provides one of the only legal ways to keep great television content without allowing competitor ads to be shown. Their Competitive Ad Block system will ensure that no other dealerships or car brands can get an ad message through on your screen. Topic Blocking: As Macagna highlights in the Automotive News article, his dealership greatly appreciated their ability to block out topics from appearing on their screen. When politics gets to be too controversial, It’s Relevant TV has the ability to block just those videos out. You can even block out news stories about Tesla if you feel like they are going to compete with your brand/image. Customer Service: Clients of It’s Relevant TV are assigned a client success manager who will provide best practices for using their TVs effectively, act as a thought partner on marketing campaigns, and will assist you with graphic design work that’s being featured on the TV. The client success manager provides some great additional value, and it is all included with the regular low subscription fee. ABN boasts “effective digital signage solutions for the automotive industry;” basic services starting at $499/month, with average dealerships paying +$1,000/month for a variety of additional services. Services that car dealerships are paying for include lounge TVs, digital signage, video walls, service menu boards, and appointment boards – which can add up to a lot. ABN has been serving the industry for years and has a large footprint since it got into the industry early, but it remains one of the most expensive options. Spectrio offers clients solutions in digital signage, on-hold messaging & marketing, overhead music & messaging, as well as wi-fi marketing; charging upwards of $125, to $149/month per service. When it comes to content, Spectrio plays videos from networks like CBS or NBC, and streams shows and entertainment clips from a short list of categories. With basic services starting at $99/month, Digital Dealership System offers dealerships a short selection of location-based digital signs. Signage options are broken down into sales signs, service signs, customer lounge signs, sales leaderboard signs, and kiosk signs. Visitors are exposed to the brand on select screens; others will show them how much money they will have to spend on services such as oil changes, tire rotations, or fluid services. Lounge TVs feature commercial free, and live-TV options. As with any service which combines digital signage with broadcast TV; make sure you have the legal right to do so. If a service is integrating cable TV you may find your business is liable. Make sure it’s legal and not violating the Terms & Conditions of your cable/satellite provider. Be safe! Coming in at $399 a month with a one-time channel development fee of $995, and a cost of equipment fee of $351 (additional TVs costing +$200/month & +$350 for setup); Auto Dealer Network TV introduces itself as a live internet-delivered TV service that provides auto dealerships with news and entertainment from networks like CNN and HLN. Programming is limited to news, business and financial, sports, updates, weather, lifestyle and travel segments; as well as entertainment features from HBO, TNT, truTV, and TCM. Beyond basic programming, Auto Dealer Network TV offers the uploading your own personal dealership videos to expose visitors to your brand, sales, and services. Additionally, a number of generic Sample Videos are available to users at a cost of $100/per video. These videos can be custom-tailored to your brand at $800 for 4 videos, $1,400 for 8 videos, and 12 videos for $2,000. Costing around $350 to start, with average clients paying upwards of $600/month – AutoVision TV provides dealerships with a variety of brand-tailored TV channels to outfit showrooms, lounges, and service centers with; with the goals of promoting sales, selling you on car parts, as well as services they want to get you interested in. While you wait, you’ll be watching inside-vehicle tours, staff profiles, featurettes on satisfied customers and their new car purchases, as well as what people on social media are saying about the dealership; while rotating sports, finance, and weather boxes play on the side. Additionally, you’ll watch plenty of other car-relented content to pass the time; which is great if you’re into cars, but less-so if you’re not. AutoVision TV also features an optional “TV Window” mode for users with cable/satellite TV. Before throwing this up in your main lobby, do your homework. Business TV software that modifies, or changes the service from its original form without the expressed consent of your provider may violate the Terms & Conditions listed in your service agreement. For the same reasons you can’t play Netflix, or DVDs in a place of business, you can’t alter portions of broadcasts when they don’t suit your needs. Compared to other automotive TV networks, It’s Relevant TV is a feature rich service that costs the least, while giving the most. Unlike most of its competitors, It’s Relevant isn’t limited to just the automotive industry; it has success in serving clients, and audiences, across the U.S. The same people who visit your dealership visit restaurants, medical offices, salons, and other places that It’s Relevant serves. While the places are different, the mission is the same: Give people in each place something they will connect with. For the same reason a doctor’s office shouldn’t show only medical content; a dealership shouldn’t limit its content to only automotive. The more interests you cater to, and the more variety you have, the more your visitors will be interested in your messaging. In the end, it’s people you’re trying to market your services to. The best way to get them to come back more, and spend more, is to create the best experience for them while they’re at your location. Put something on the TV people will enjoy, and your messaging will do the rest. *All pricing and service details included in this article were either sourced from the Automotive News Article or directly from the service’s websites in February, 2019. Have a business, product, or service you’re trying to advertise? Putting your message where it matters is the key to reaching your target customers. But with so many vehicles to drive your messaging to the public, settling on the right one to advertise on can be difficult. This article will identify the top 5 most popular platforms to consider for your advertising dollars. 5.) Newsletters & Media: There’s no better target to advertise to than a preexisting customer, client, or patient. These people already know, trust, and have experience with your brand, and are more likely to buy from you in the future. The value of repeat business cannot be overstated. It’s easier to get someone who’s familiar with your brand to keep coming back, than it is to get someone new to try your services for the first time. Emails, newsletters, and other digital reminders are a great way to remind people that you exist, and that there’s plenty of reasons for them to revisit and use/buy your products/services. As easy and cost-effective as emails and newsletters are, there’s always the risk of becoming spam. And being “spammy” can harm your brand’s image. Companies that only reach out to customers who voluntarily signed up to receive emails generally yield more success when it comes to generating repeat business using this method. 4.) Radio Ads: Whether it’s on your way to work in the morning, sitting in a waiting room, or listening to a coworker’s desk radio; one way or another you’re bound to listen to the radio at some point. Depending on what you’re trying to sell, radio advertisement may be your ticket – with costs as little as $200, or as much as $5,000 for a slot, there’s plenty of options to fit your budget. If there’s a downside to advertising on the radio, it’s the well-known fact that people tend to dislike radio commercials. How often do people change stations when an ad comes on, or get frustrated when a commercial break goes on for minutes? It’s a valid point to consider. Folks aren’t the happiest when they’re stuck in traffic; it isn’t your fault that they’re miserable, but your upbeat commercial may be the last thing they want to hear at that time and may actually form a negative association with your brand. If you’re concerned about making your advertising dollars count, the radio might not be what you’re looking for. 3.) Billboards & Outdoor Advertising: Signs on the highway, on buses, benches, and buildings are the go-to for many companies when they want to get the word out about a new product or service. A monthly fee is a small price to pay for constant, everyday exposure if the billboard is placed in front of your intended audience. The budgets have a large range; $3,000-$30,000/month for a billboard, or $150-$600 / $3,000-$6,500/month for transit advertising. Depending on how much you have to devote to marketing and advertising, spending a lot of money for an unknown, unguaranteed ROI might be a risky move. Consider alternative options, and find something that works within your budget. 2.) Internet/Website Ads: Google ads which bump your website up to the front page of related searches, or advertisements on the tops or sides of webpages are a growing favorite amongst companies that are putting their message where people are spending most of their time; browsing the internet. The cost of advertising online varies, but you can expect to pay $1-$50 per click, or $7+ per 1000 impressions on sites like Facebook. While advertising online feels effective because of the massive numbers the reports boast, you may find that impressions may not be all that impressive. Your ad is often buried on a page, or lost among too many for people to be able to get your message or act upon it. 1.) TV Advertising: The standard go-to for impactful, widespread visual reach. People have been advertising their products and services on TVs since Bulova Watches bought a 10-second ad in 1941 for $9. Since then, advertising has grown into a multi-billion dollar industry; the TV being the most widely recognized means of educating people about a brand. However, advertising on cable TV can be costly. A 30-second local ad can cost as much as $1,500, whereas national ads will run you upwards of $120,000. And the mother of all ads- a Super Bowl spot runs $5,100,000 for 30-seconds. Any of these amounts can be too much money to put aside for advertising, especially if you’re a small company. If you’re looking for a cost-effective way to advertise that incorporates the best medium to fit your advertising budget, consider It’s Relevant TV. Advertising can expensive, but it doesn’t have to be. It’s Relevant combines the best aspects of TV advertising, online and out of home. offers some of the most cost-effective television advertising on the planet. At just 30–50 cents a play, you’re able to run a standard television commercial in great targeted locations across the country. In addition, It’s Relevant features scaleability and specificity. You’re able to limit your ad buys to geographic zones and business categories that you specify. Do you want to reach people in restaurants within 10 miles of X city? It’s Relevant TV lets you do that. Purchase ads in just those locations, and get exactly what you want while eliminating wasteful spending. Is a 30-second Super Bowl ad really worth $5.1 million? For some businesses it definitely is. If you have 5 million to spend, it’s a quick way to get a TV ad to a mass (100 million viewer) audience. But for your business it’s probably not anywhere near worth it. You’d likely be much better off paying to reach specific sets of customers that can act upon your message, and that will want your product or service. Advertising your brand is essential to the success of your business, product, or service. Yet despite how important advertising is, there’s still a large number of people who forget the basics, or could benefit from a casual reminder. This article will explore the top 5 things to consider before advertising your brand. 1.) Who is your audience? Where do they go? It’s important to think about your audience as a whole, not just about where you want them to go. If you advertise products for a vitamin company, you may think that a medical office is the best place to advertise. And it is a great place to start, however, the people who you’re reaching in that medical office may only visit that place a couple times a year; whereas there are plenty of other places they visit more frequently – places you could be advertising into as well. Have you ever heard the phrase “A smile makes all the difference?” The same thing applies to where you choose to advertise your brand. Remember that great ad at the DMV? Or that commercial on the radio while you were in bumper-to-bumper traffic in 100 degree weather? If so, you probably don’t remember it very fondly. You may have a great commercial, with a great message; but if that message is airing in a place, or at a time when people are frustrated, it will be poorly received through no fault of your message. Make sure you’re advertising in places and through platforms that put people in a positive mood. Avoid digital advertising platforms that surround your ad with ads from other businesses. Few things are more boring than a channel full of ads. The most effective advertising networks feature real content to draw in people’s attention; exposing them to a limited number of ads while they’re invested in what’s on the TV. Viewers aren’t interested in a TV that predominantly plays commercials. They need to have a reason to look at the screen before they can see what you’re selling. How you get your message across is just as important as the message itself. SEO, text, and image ads can generate traffic for your website and social media accounts, but if you want to tell a story in order to acquire new customers, video is the best medium to do so. The trick is finding the right platform for those videos that is cost-effective, reaches the right audience and is not too ad heavy. A business that operates solely online should definitely have a strong advertising presence on the internet; whether it’s via SEO, search engine ads, or regular old side-scrollers or pop-ups – getting clicks is crucial. However, the toughest part about having all your eggs in one (virtual) basket is the difficulty in building trust among customers. Getting your messaging out in the real world, not just online, will help grow your brand, and trust around you and your products. It’s Relevant TV is a cost-effective advertising platform which reaches a wide range of television audiences across the country. Currently operating in over half the U.S. states, It’s Relevant is the go-to for businesses and companies that are looking for an inexpensive advertising solution, or want more control over the types of audiences they’re trying to reach. At 30-50 cents a play, businesses are taking advantage of a widely viewed, yet targetable TV platform, at discounted video ad rates usually only seen in online video platforms. It’s Relevant TV is worth considering if you’re on the fence about how to spend your advertising budget. The best way to get your restaurant moving forward is to embrace forward-thinking technologies. Whether it’s upgrading to digital menu boards, installing state-of-the-art beverage dispensers, or investing in self-service ordering kiosks; there’s no shortage of new ways for business owners and franchisees to improve efficiency, quality of experience, and customer convenience. With so many areas to improve, and even more ways to improve them with the innovative technology that’s out there today, business owners and franchisees are in a unique position to stand out amongst competitors. However, sifting through the options and settling on the best improvements for your business or franchise can be overwhelming, and finding out where to begin can be just as difficult. This article will identify one major, yet easy area of improvement most businesses and franchises have in common – the TV. 1. Who/What is the TV for? : In most cases, the TV is probably for your visitors, as TVs are a familiar, comfort element. If you’re ever sitting down at a restaurant; if you’re not looking at your phone, you’re probably looking at the TV. It exists as a casual distraction. Something for people to watch and help pass the time while they wait, or eat. 2. Where is the TV located? : Almost as important as what’s on the TV is where it is in your business. Does your business have a place for people to sit while they’re waiting to be seen or served? Does it have a bar? A lobby? Or dining area? These are all appropriate places to hang a TV – that goes without saying. You get the most out of your TV when it’s someplace people are going to linger for a while. 3. What’s on the TV? : Taking into consideration the first two points above, you now need to put the right thing on the TV. 9 out of 10 times restaurants use basic cable or DirecTV – this is a classic mistake. Years ago, short of relying on a broadcast antenna, basic cable was just about the only thing to put on a TV. But, in the 21st century, this just isn’t the case. Forward-thinking business owners today are turning to digital signage solutions over services like cable or DirecTV; recognizing them as better alternatives for their business TVs. But digital signage alone won’t do it for your customers. The TV in your restaurant (QSR, deli, cafe, coffee shop, or pizza place) is an opportunity to get important messaging across to your customers. It’s a tool, which if used correctly, can improve marketing, visitor experience, and brand awareness. But, not when you’re stuck with cable or DirecTV. You need a service like It’s Relevant TV. 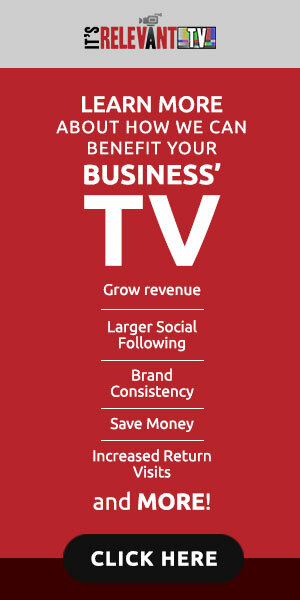 It’s Relevant TV is a custom TV network for businesses and franchises. It’s a service which offers the entertainment factor cable provides, but is presented in a fashion that is more appropriate for business settings. IRTV’s content is short form, and organized in a list of 40+ categories to pick and choose from.